Security Expert Centre » Research Dossier → HOW CAN CEE COUNTRIES BECOME MORE ATTRACTIVE FOR INVESTMENTS THAN THE EMERGING MARKETS? Research Dossier → HOW CAN CEE COUNTRIES BECOME MORE ATTRACTIVE FOR INVESTMENTS THAN THE EMERGING MARKETS? The idea of Visegrad Group was to unite Poland, Hungary, Czech Republic and Slovakia for faster market reforms and integration into the European Union. Today, being members of the EU for more than 10 years, the idea of Visegrad 4 became questionable. The crisis in Ukraine, different positions of the Group concerning sanctions against Russia and EU policy towards the East as a whole appeared stronger than the common goals of the group. But from the economic point of view there are a lot of reasons for the Visegrad countries to stay united and even to expand their union. Central and Eastern European countries are still restoring their economies after 2008 crisis. According to the Standard & Poor’s “Central and Eastern Europe sovereign ratings trends 2015” report some of CEE countries (The Czech Republic and Poland) “stand out positively in terms of monetary flexibility, both benefitting from flexible exchange rates that served them well during the crisis by absorbing part of the external shock through depreciation”. Net general government debt averages close to 50% of GDP. Per capita GDP, which remains moderate to low for the region, ranging from US$7,712 (Bulgaria) to US$23,962 (Slovenia). The average per capita GDP in the CEE countries is US$15,183 – for Eurozone states it is US$33,300 (excluding Luxembourg). This shows an enormus division in wealth between CEE and Western European countries, despite the former having far more cautious debt policy than the Eurogroup. Big Three credit-rating agencies are holding stable economic outlook for CEE, nevertheless they have downgraded credit ratings for almost all countries in the region. Some of them, like Czech Republic and Poland, absorbed part of the external shock through depreciation, due to flexible exchange rates. The rankings across the region are stable and they vary according to Standard & Poor’s rates from speculative BB- (Romania) to attractive A+ (Slovenia). According to IMF survey, Emerging Markets are losing their mementum. India alone shows some increase in the first half of 2015 and will rise to 8,3% in 2016 as forecasted by Fitch ratings. These tendencies can be explained by the cautiousness concerning the rising risks for the investors and political instability in the BRICS countries especially in Russia after the conflict in Ukraine exploded with full force. 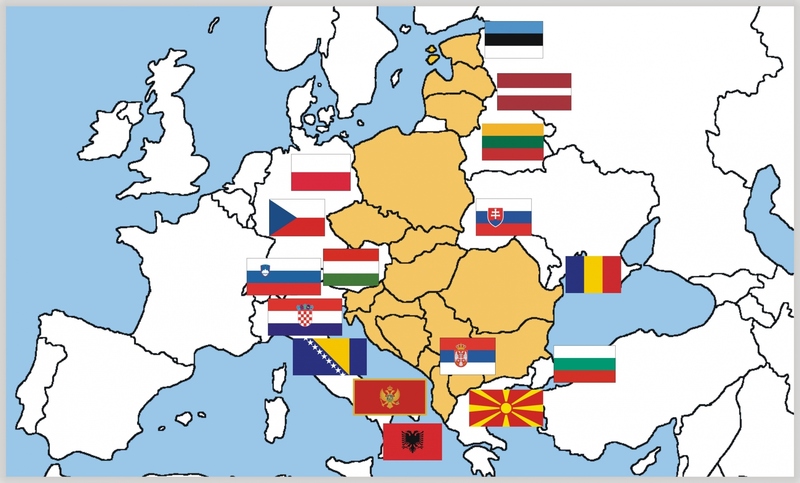 Such situation offers CEE region countries a great deal of opportunities for the new economic growth and a chance to restore the foreign direct investment indices to the pre-crisis rates. The fact that volumes of foreign direct investments in the most CEE countries have been decreasing since the crisis of 2009 affecting the welfare of their citizens, should be taken into consideration. China’s slowdown and market volatility in the Shanghai Stock Exchange that to some extent caused fall of the prices at the NYSE and other main world Stock Exchanges in August, shows that investing in China can be as risky as in other developing countries. A lot of famous economic and political scholars are insisting that China is going to become the middle-income country and that some internal political turbulations are expected because due to inherent contradictions between communist’s ideology and the current economic model of the country. CEE countries, apart from stable democratic political system and transparent rules of their markes, have favourable geographical position close to the Western European consumers. Therefore, the logistic spending for investors can be minimal. Especially if the potential of access to the three seas (Adriatic, Black and Baltic) is fully used in the transport infrastructure of the region. European Union and NATO membership, also ensures belonging to the Western bloc. Due to the EU membership, there is market access for entry of goods and services into the entire European market. Another luring factor is that people in CEE countries are highly educated. Moreover, thanks to different student exchange programs such as Erasmus, quite a few of them have had opportunity to study in prestigious Western European and American Universities. This is why Standard & Poor’s rightly defines CEE, as “a region that offers an attractive hybrid of emerging markets with elements of developed economies – most notably Poland and the Czech Republic – and a high degree of conformity to international standards”. All in all, according to the surveys of the Big Three: credit-rating agencies, IMF, World Bank and outlooks of investment companies like Franklin Templeton the biggest threat to the investment attractiveness of the CEE region is the geopolitical tensions over Ukraine and potentially aggressive foreign policy of Russia towards these countries. However, Russia is unlikely to be aggressive towards NATO allies, and even if it was, its initial moves would be towards Baltic countries, as they are geographically closer to Russia and have a big Russian minority. Another potential problem is the dependence of the region on the economic situation in the Eurozone, especially Germany as it is the biggest economic partner for Poland and Czech Republic. The problems of Greek debt and Greece’s potential exit from Euro zone have been the main challenges for the European politicians this year. In the summer, these issues were extremely sharp and exerterted key influence on the Euro exchange rate and the economic growth of the entire Union. Another internal challenge is the surge of populists. It showed in the first round of the last presidential elections in Poland when in the first round 20% (third place) of votes were given to an ex-rockstar Paweł Kukiz, who is highlt critical of the current Polish Constitution and the two mainpolitical parties. This rise of populism can be explained by disappointment of the youth about the current unemployment rate (22,2% CEE average for under 25s, according to Eurostat) and the economic situation in general, which is being followed by a large- scale brain drain to the Western Europe and other more economically developed regions. Countries of the CEE region should demonstrate their political will for union to attract foreign investments. Recent history shows that unity of the countries of this region for the common purpose brings success. The example of such unity at the beginning of the 90s was the early days of the Visegrad Group. But the 2008 economic crisis jeopardized the very idea of the united Europe and had a negative impact also on the Visegrad Group, thus for now cooperation between countries seemss only symbolical. CEE countries have to unite their efforts to restore their economies after the economic crisis and improve regional potential, irrespectively of their political contradictions. This could be done by, for example, widening of the current Visegrad Group and including Romania, Bulgaria, Croatia and Slovenia. Alternatively by launching some new regional initiatives, the aim of which would be bringing foreign direct investment back to the region. The cooperation between countries in tax policy, infrastructural projects and the full use of the region’s geographical and human potential are bound to result in improving the welfare of its citizens.